Q: You mentioned SMC the other day and I tried it but it doesn't seem to work. I get a message that reads "Starting the server for the first time may take a few minutes" and then nothing happens. SMC runs walks crawls along in Java. 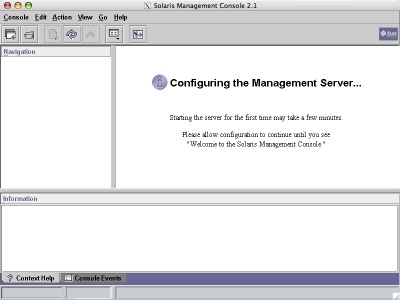 I have never understood why Sun try to write apps in Java and then run walk crawl them under Solaris - Java can be quite snappy on platforms like Mac or Windows but it really drags on Solaris. Basically the message you are getting is false advertising unless your definition of "few" extends to "quarter of an hour". Be patient. It might work. Eventually.